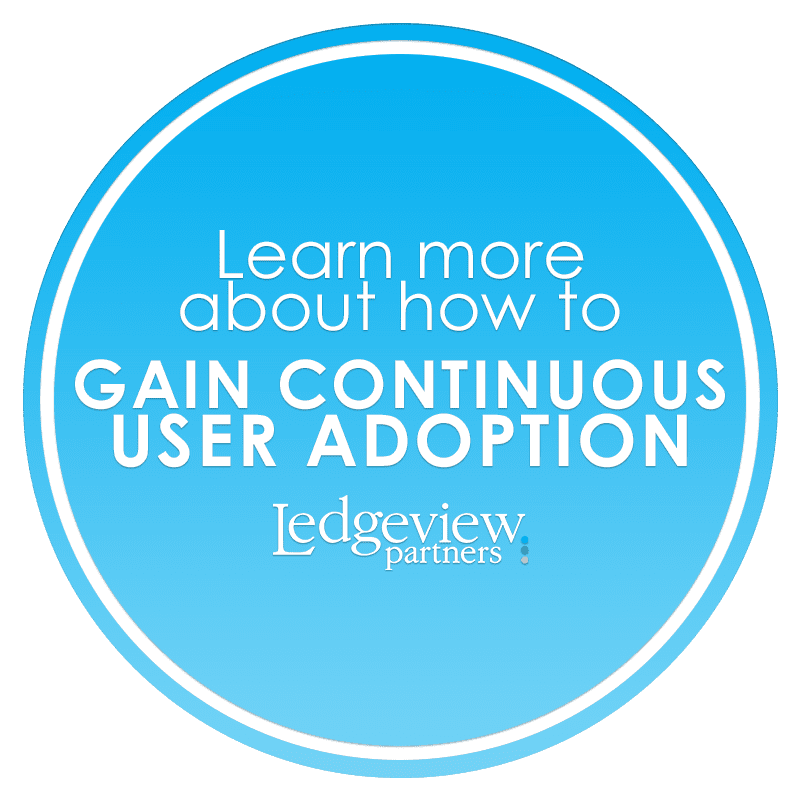 Are you struggling to gain continuous user adoption? You’re not in it alone! In fact, this is the most common issue users report after implementing a CRM system. In this post, we are providing 5 more important tips for gaining continuous user adoption, whatever your business size or type, whatever your experience, whatever your industry! A CRM system won’t do much for you if you don’t make it a part of your regular work routines. It’s no good to you if it’s just sitting there! Leadership, or, in this case, the CRM Champion, should enforce CRM among users to that user adoption doesn’t fail to pick up. It may sound harsh, but it’s true!To avoid losing user adoption, celebrate and support your CRM system from the get-go. Use it in sales meetings, and require users to input information into the system. Pull up CRM during your regular coaching sessions. Do what is most effective for your team and their unique needs. Ask for their input to better understand what they need out of the system and leadership to make adoption easier. Once you implement CRM, start living by the rule, “If it’s not in CRM, it doesn’t exist”. 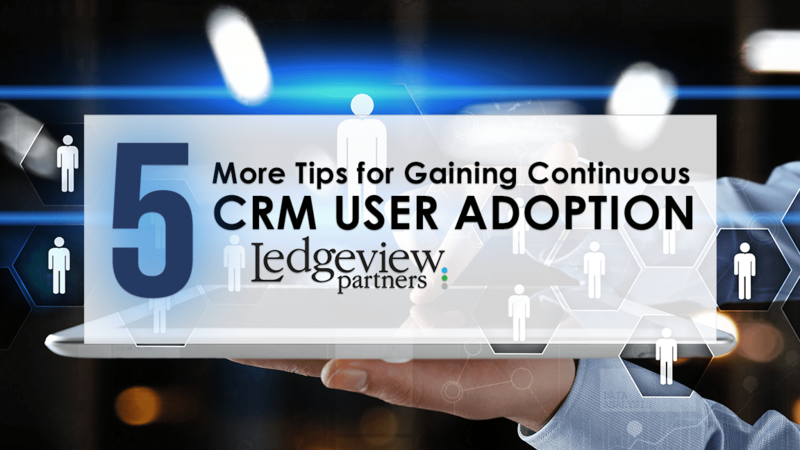 To keep updated, we highly recommend you attend Ledgeview Partners user group webinars, especially if you are a Salesforce, Microsoft Dynamics, or Oil and Gas user. These user group webinars are FREE live events that help you get the CRM education you need to succeed, build your expertise, and gain valuable insight to share with your fellow users.Within your organization, you may also consider conducting internal user group webinars specific to your organization’s goals and needs, or host lunch ‘n learns to keep the tone light, and information fresh. To keep an eye on your CRM users’ system knowledge, you should consider polling them and ask them to rank their own proficiencies with different functions in your CRM system. This is one great way to make your CRM coaching program better! It will help you understand where they’re falling short, and what their needs are in terms of a CRM education.When you keep your users’ skills up to date, you help them adopt the system and build CRM confidence. You may incorporate video training into your program to engage your users. There are many ways to go about it, so it’s important that you are listening and responding to the needs of your users as they learn. Their input is invaluable for increasing user adoption. You may also have a CRM user periodically watch a video in CRM, then report their findings back to the team to keep the CRM conversation alive and thriving.Another effective method you can engage your team members with is having them identify a feature in CRM that especially helps them, and go over key findings as a team to help them become a more confident and enthusiastic CRM user group. When you are struggling with any of these problems, or have another problem you’d like to address with your Salesforce, Microsoft Dynamics, or CRM for Oil and Gas system, Ledgeview is here to help. Our experts listen to your ideas and needs, to help you use your CRM system more effectively. Download your own copies of any of our eBooks and infographics, watch on-demand webinars and tutorials, and subscribe to our blog.Our love for CRM is large, and our resources are equally abundant. Contact us to learn more about our resources and how we can help you find CRM success.